Flashback to London, early February. K and I found out about Covent Garden just after we returned from our first visit to this amazing city back in ’10. I missed out on something BIG. I’m the worst researcher-planner when travelling, so when we decided – on a whim – to go back to London, Covent Garden was the first thing on my list of must-sees. And am I glad we went here! Not only is it one of the more cozy places in the city, it’s also very vibrant, with lots of street artists, art-sellers and more quite shopping streets (in comparison to Oxford St.!). In the basement of one of the shops, this dress was waiting for me. 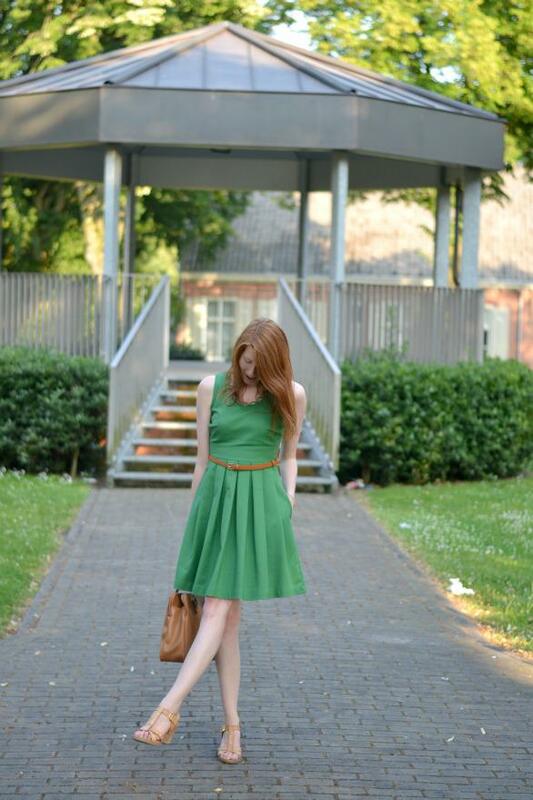 As a redhead, I believe a green dress is an absolute must-have and I did not have one. I once saw my green dream dress at DVF, but being way out of my price range I had to let the idea go. And then I dragged K into this darling little shop of a brand that I didn’t know, with lots of pretty jewelry and tiny knickknacks and decorations. The shop assistant kindly told me there was a downstairs area as well. I normally hate it when shop assistants push me but boy, am I glad she did this time! I had to wait all the way until the 24th of April, for the weather to finally heat up and it being appropriate and bearable to wear this pretty number. I look at it as Mother Nature’s gift for my birthday. Sins last week, A tiny heat wave is resting over Belgium and K and I went out for ice creams multiple times already – I love it! 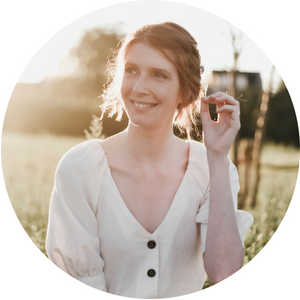 One day I remembered we didn’t have photos of me in this dress for the blog yet – and most importantly, that there was an old kiosk right outside the ice cream shop! Add to that recipe that it was the famous golden hour, and BAM, a huge series of photos and me having a hard time picking the best ones. Therefor… There’s more after the break. Love that dress! What a great location! That green looks wonderful on you!! Love that you accented it with brown! So pretty! 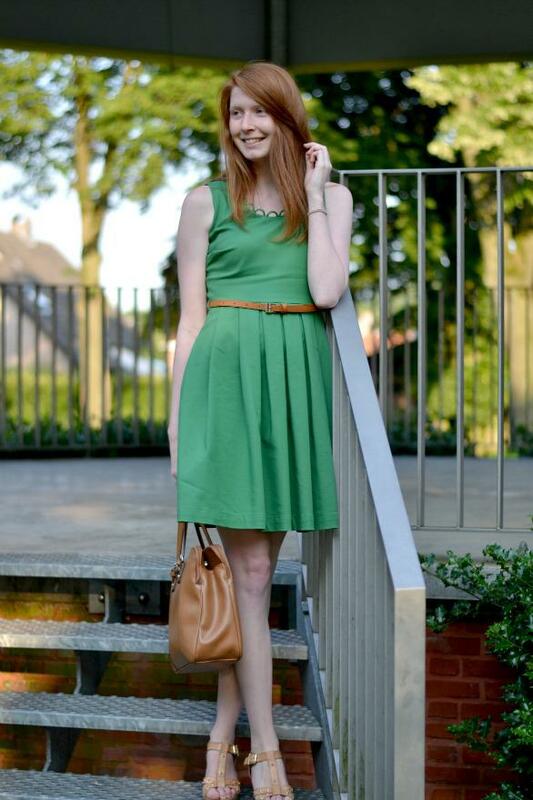 Love how you look in green and brown – gingers do so well in these colors! Staat je leuk dit kleedje en ook supertoffe foto's! I never thought about wearing a green dress for a redhead but it compliments your hair and gorgeous fair skin so nicely! I feel it's the perfect length and I love the pleated detail on the skirt! You look amazing in that shade of green! such a classy summer look from head to toe!! this green dress is perfection! so flattering! that dress looks just beautiful on you. i need to visit london! you guys have the best shopping. Ohhh that dress! I love that dress! the neckline is just gorgeous. Love it on you, especially with these cognac accessories! Heel leuk kleedje! Je staat goed met groen! I agree with every single point made in this post, and I REALLY love that dress! Gorgeous dress!! I'm so loving it. 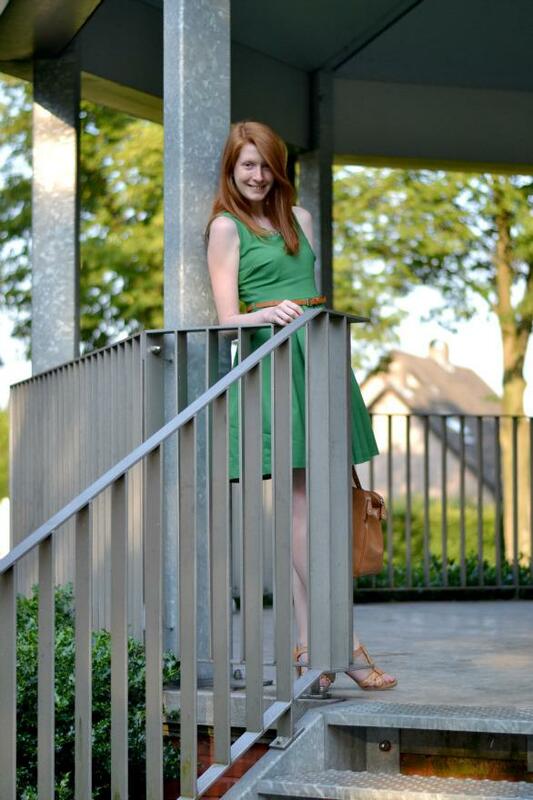 As a redhead, a green dress is most definitely a must. You look stunning in this one. Such a fun shape to it too. 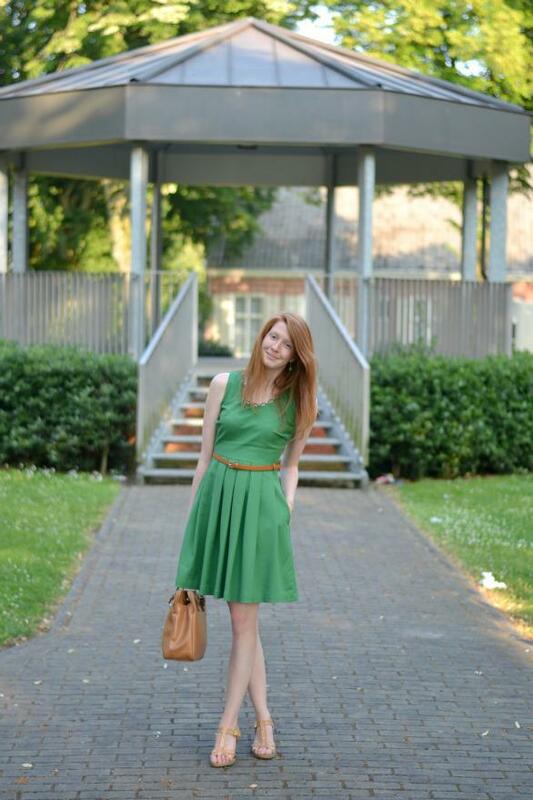 Ik vind ook dat groen super mooi past bij redheads! echt mooi! staat je super!!! This dress is beyond beautiful on you- everything about it is perfect from the cut to the color! It's hard to get around the heat and look fashionable, but you look so put-together and chic! That color looks soooooo good on you! Lovely! Green goes well with your skin tone and coloring. You should always wear Kelly Green. It is a fabulous color on you! The color of this dress look amazing with your hair! Love the scalloped detailing on the top especially! Wat een prachtige jurk! Staat je heel goed, en vooral vind ik het heel mooi contrasteren met je rode haar! Covent Garden is inderdaad erg mooi! Waaaauw die jurk staat fantastisch bij je haar! Je ziet er echt super uit, en je haar wordt inderdaad prachtig benadrukt. Oohh dit staat je echt heel mooi! wat een mooie kleur! staat je goed, leuk gecombineerd! i love the timelessness of this outfit Nikki. it feels as though you've stepped right out of another era while still maintaining a current vibe throughout. 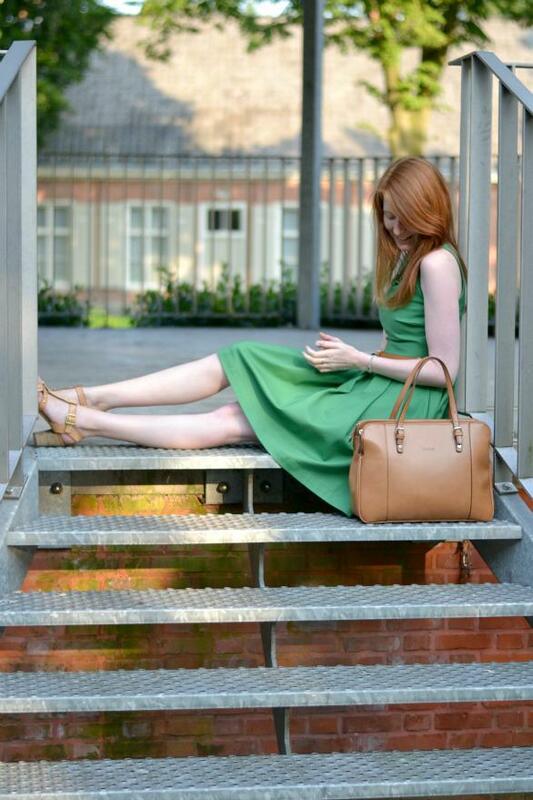 green paired with camel – what a combo! you look charming and trim in these fab photos. what i wouldn't give for legs like yours, not to mention your gorgeous hair is the crowning glory. the golden hour is enchanting, isn't it?! Dat groen staat je beeldig! Supermooi jurkje, het staat je echt goed! En wat we toch al niet doen voor onze blogs hé 🙂 heatwave of niet 😉 (zit stiekem gewoon al een hele week in een shortje en topje rond te lopen). Wauw Nikki, you look fabulous 😉 Groen staat je echt super! What a beautiful, beautiful outfit. I adore your classy dress and it looks amazing on you. Cute shoes, too! What a beautiful, beautiful outfit! I love the classy green dress, and it looks amazing on you. Cute shoes, too!